‘Rewilding’ is a word that’s become increasingly popular among those interested in discovering a more seasonal, wilder way of living. But what does it really mean? Rewilding is a radical mode of conservation, which requires human beings to rescind control, step back and allow an ecosystem to restore its own balance. It means stopping practices such as burning heathland (known as ‘swaling’ in the west country), damming rivers, or allowing unnatural numbers of sheep, deer or ponies to graze. All these practices, while sometimes traditional, are intended not to help ecosystems thrive, but to give farmers more opportunities to feed their animals or till the soil. Unfortunately, in Britain, many of our well-known landscapes have been over-grazed and ‘managed’ to within an inch of their lives, resulting in upland zones that lack any significant diversity of wildlife and are dominated by monocultures of bracken, heather and poor-quality grass. In most European nations with similar topography to Britain, however, these uplands are only lightly farmed and therefore mostly forested, which is the best environment for biodiversity. Rewilding is, in essence, about bringing this diversity back to our landscapes. Life, we find, is not simply a linear chain of events, but networked, complex and – undeniably – beautiful. When nature is given a vote of confidence and allowed to pursue its own ends, the results can be spectacular. Rewilded places have the potential to captivate us. Fascinating lichens, fungi, butterflies, birds, rodents, reptiles and amphibians all have a chance to find a home again. Rewilded places offer something new with every visit, every change in season. In the biggest projects, we might have the chance to encounter a wild boar or a beaver, maybe even one day to spot a wolf on a distant ridge. Not only would all this be thrilling, it would help us to live more wildly. Nowhere shows the changing seasons better than a wood. Seeing those tiny interactions between tree creeper and insect, frog and leaf-shade, weasel and burrow, would make us more mindful of our own connections to the living, breathing world around us. It would be ours for the looking, as well as its own to do as it liked. I think rewilding would benefit both people and the planet – and I think we both need defending. A more reciprocal, sensitive form of conservation is only going to come out of conversation. We need to kick-start the debate. There are already a number of fantastic projects happening on a big scale – Summit to Sea in West Wales, for example, and the Alladale Wilderness Reserve in Scotland. Some of the big conservation charities have also got on board, albeit often quite cautiously. But there is still a long way to go – especially as rewilding can and should only happen with the full, informed consent of local communities. There are misconceptions to overcome too. The idea of reintroducing wolves, for example, delights some people and terrifies others. But while species introduction is an element of rewilding, wolves would not be appropriate for most landscapes and would only ever be introduced to very sparsely populated environments. Mostly we’re talking about pine-martens and missing birds. Moreover, many people who live in towns, or even in agricultural parts of the countryside, think rewilding isn’t relevant to them because it could only happen somewhere far off. But I hope that the distinction between urban and rural can be collapsed here, and that we can reintroduce wilder ways of living for all. Urban biodiversity is fascinating in its own right, and even the smallest plots in ‘rural’ areas can be seeded with wildflowers, or incorporate wildlife corridors. As a curator and writer, I hope to bring people together to debate these issues and to work across the boundaries of disciplines and locations to find new solutions to the rewilding question. There is a way of living more wildly, co-existing peacefully both with the natural world and with other people. But we need to collaborate to find it. Anna Souter is a writer and a curator. Together with artist Beatrice Searle, she is co-curating Rewind/Rewild, an upcoming exhibition and Rewilding Forum at OmVed Gardens, Highgate, North London. Exhibition 1-7 May 2019. Rewilding Forum 4 May 2019. Jessica : I’d love for you to start by telling us more about you and your business, how Edge and Company started, and what it is you do? Milly : Edge and Company was founded by myself (Amelia Edge) and my partner Steve Coley. Our main aim was to create a forward thinking wellbeing and lifestyle brand, which gives back to people in need through every purchase. Our products are handmade in the UK and worldwide by people living with disabilities, mental health conditions, homelessness and addiction, who find it very challenging to access and maintain employment. Every product sold will help to support organisations that are striving to break perceptions and social stigma, by building acceptance and employment opportunities for people living with life challenges. This is what we call ‘Radical Giving’. Jessica : Can you tell me about where you found your inspiration to start your company? I purchased one of their innovative exfoliating soap pebbles and It felt amazing that I had somehow helped to contribute and support this inspirational company. I found this idea really exciting - a great product and the money I’d spent going to a great cause. Soon after, we visited the homewares trade show ‘Top Drawer’ but really struggled to find any suppliers that shared the same ethos as The Soap Co. After hours of searching we managed to find two more suppliers which lead us to the idea of creating a new shopping platform experience where every purchase would give back in some way and so began our hunt for similar charities and social enterprises. Jessica : What do you love most about what you do? Milly : Some of our suppliers are local to us and we have been given the opportunity to visit their workshops and meet the people who are involved in the making of our products. This has been an invaluable and extremely rewarding experience and one that was lacking in our previous work. To be able to see the production process of our products from start to finish and personally thank everyone involved has been very heart warming. We look forward to meeting and working with lots of new suppliers in the future. Jessica : Can you tell us about your work-space, and what a typical day at Edge and Company is like? Milly : We are lucky enough to have an office space at home where we can get inspired by our surroundings. We like to personally test our products and make sure that we are selling amazing, innovative items that we love. Right now we are working hard to find new suppliers and build on our product range. If it’s a Sunday, you’ll find us at Spitalfields market, selling all of our beautiful products in person. Jessica : What impact would you like to create with your work? Milly : Ultimately we want to spread awareness and help build acceptance and employment opportunities for people living with life challenges, whilst continuing to show people that there is an alternative to mass produced products found on the high street. Jessica : And lastly, if someone reading your story were inspired to follow their own creative dream, what advice would you give them? Milly : For anyone that has a good idea, I would recommend persisting with it. I’ve found that if you stick with an idea for long enough it will naturally become refined and come to fruition when it the time is right. Find out more here or follow Milly + Steve on Instagram, Pinterest and Facebook. Usually in Cornwall, February is the month of storms. Just when the steely, harshness of January begins to soften, the snowdrops emerge and the days begin to lengthen again. It’s then, that one begins to fool oneself into thinking that spring is close within reach and that’s precisely when the storms strike. Last February we had a bout of snow storms which was most unusual for Cornwall, in particular the western peninsula where I live and where we enjoy a microclimate which keeps the temperatures mild. The storms blow in all sorts of detritus off the seas, dredge up all manner of things from the seabeds and the beaches become a veritable treat for the beach combers of the south coast. 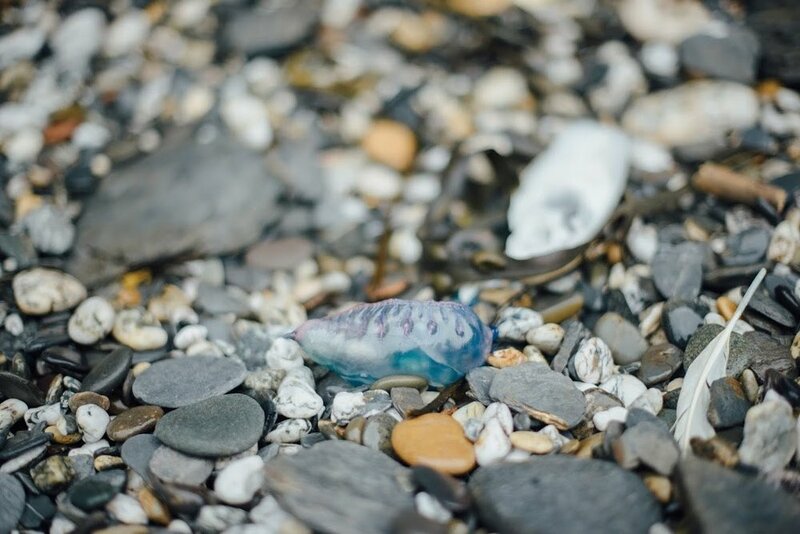 The usual finds; sea glass, pottery and various shells are easily found on many of the Cornish beaches all year round but the storms churn up the sand and reveal fresh and exciting finds that may have been overlooked before. Once, I even happened across a stray buoy from a boat which I took home, you’ll find many tiny fishing cottages in rural west Cornwall that have decorated their gardens with buoys washed up in coves. Sea glass (also colloquially known as drift glass) takes on average 20-40 years to become enough withered by the waves that it gains its smooth, frosted characteristics. It can even take as long as 100 years so it’s exciting to think that when you find a smooth, aquamarine blue piece, you’re holding something between your fingers that perhaps once belonged to a victorian gin bottle or may have even washed up on the shore, a broken relic from a ship wrecked hundreds of years ago. In west Cornwall, you’ll have to get up early, beat the dog walkers and mind the tides to have your best chance at finding some beautiful pieces of sea glass however if you travel out to our nearby archipelago, the Scilly isles, there’s practically no sport in finding it as you’ll be tripping over the biggest, chunkiest turquoise pieces you ever did see. What’s more exciting though, far more exciting than withered and worn Victorian glass, is when the storms blow in some curious creatures from the high seas. Hydrozoa such as ‘By the Wind Sailors’ are a frequent visitor of the Cornish coasts in February and March. With their space-like dreamy blue colour and little shiny clear sails they’re almost alien looking and quite magical. They live and drift on the surface of the ocean, feeding on the plankton but the strong wintery onshore winds blow them up onto the beaches. Although they’re a very pretty decoration and exciting find on the Cornish beaches, it’s a great shame as many dry out and don’t survive if they get blown up too far for the tide to rescue them. Last year, with the storms, we also witnessed a glut of Portuguese man-o-war on our beaches. Although beautiful, they are an incredibly dangerous jellyfish and have been affectionately nicknamed ‘neon death pasties’ by some of the locals here. If you’re beachcombing at a spot where the river mouth meets the ocean, you may also find some beautiful Oyster shells washed up. Oyster shells are one of my favourite shells to pick up and on one of our recent visits to Looe last weekend, we did manage to pick up a few of them. One of the most interesting recent beachcombing finds that I’ve heard of recently was that of my friend Mariette. Down on the Lizard peninsula she happened across an unassuming lump of smelly, greasy ‘something’ which she brought home and turned out to be Ambergris. You’ve got no idea what Ambergris is? Good, because I didn’t either. Ambergris is formed in the digestive system of sperm whales and is extremely valuable and coveted by perfumers. It’s sort of ‘whale vomit’ in crude terms and if you’re a beachcomber that comes across Ambergris, you’ve struck gold. Mariette is already planning her holiday with her unexpected windfall. The takeaway from all of this is that you should forget rare pieces of shipwrecked lego or lost pirate coins, the real beach treasure to be searched for is whale barf. When you can bear to take your gaze away from the swirling swell and churning sea foam, look down: The winter beaches suddenly become an exciting bazaar of fascinating detritus and glistening, quirky, natural treasures to take home and decorate the windowsill (where many of my finds end up.) Some of my favourite finds are shells with particularly giant barnacles, fossils, hag-stones or very occasionally dried coral - I found the Isle of Wight was an excellent spot for picking up coral (another bittersweet beach find.) Lyme Regis and the Jurassic coast are excellent for fossils if you have patience, a keen eye and a dash of luck. In the wintertime, Cornwall shuts down and becomes bleak, empty and quiet. I get asked often how I survive over the wintertime here or what we do for fun. Personally, I feel that the county comes alive out of ‘tourist season’ and particularly during the stormy periods. Misty beaches, churning aquamarine waves and endless sea caves to explore, beaches aren’t just for sunbathing and building sandcastles. For me, a winter beach is an endlessly exciting, peaceful and restorative space bringing us these tiny treasures with stories to tell; stories of shipwrecks, lost fishing nets, tiny creatures from the high seas and lost cargo from thousands of miles away. Jessica : I’d love for you to start by telling us more about you and your business, how The Cozy Club started, and what it is you do? Chris : The Cozy Club started really by a lightbulb moment. I had been hosting Christmas and summer fairs in my home for about five years where entrance proceeds went to a charity called William's Fund. The stallholders were situated throughout my house so people came in and noticed various decorative things that I had done. I was asked on several occasions how I made the items and had the thought that perhaps this might be fun to teach. Being a teacher by profession, I felt I had the tools already to proceed with conducting workshops. The name came simply because for as long as I can remember I needed to feel comfort :like being snuggled deep into a worn quilt, my hands wrapped around a mug of hot tea reading a wonderful book or enjoying the company of good friends...to me that is cozy and I try to always try to incorporate that into my life. I think I feel I have a mission to try to make as many people as cozy as I can! To me, being cozy and creative are two very important aspects of life.I sat down one afternoon, looked at my fabrics and started imagining projects and that was ten years ago. Now, with the help from my husband, some of the projects are also done working with wood. The Mouse House has been a big hit to name one! Chris : I love my Cozy Club days from designing the project to welcoming old and new friends to watching the process of their creations take shape. I would have to say that what I love most about what I do is to watch those who think they are not very creative see their projects emerge from their own two hands and see the pride in their eyes as they come to the realisation that they are indeed creative. I liken my club to an old -fashioned quilting bee where like-minded women gather to find interesting conversation, friendship , share a meal and a love of creating. Jessica : Can you tell us about your work-space, and what a typical day at The Cozy Club is like? Chris : A day at The Cozy Club begins with everyone enjoying refreshments and meeting each other. Once settled in the workroom on old farm tables covered with antique linen cloths, the project is explained and all materials are provided. Help is given, but all are encouraged to make their project unique. There is a break for lunch where all join together in my kitchen to sit down for something seasonal. As many come from far, I always cook something filling and from scratch. Candles are glowing and the table is set to celebrate the time of year. . At each place, a small present sits waiting to be opened by each participant ,again, something that goes together with what we are making. Once lunch is finished, everyone heads to The General Store where a collection of farmhouse finds, fresh flowers, ribbons, fabric bundles, candles, antique quits etc. wait for them to explore. The work on the project continues until about 4 pm when tea and cake will be served. A day at The Cozy Club is a relaxing but very creative event. Jessica : What inspires your work? Chris : I am inspired by two main things. The season and what I have collected to be repurposed. I try to use things that have had a previous life . Nothing gives me more pleasure than finding something someone else has rendered as useless and using my imagination to develop a project and give it a new life. Chris : I think I would be thrilled if I knew that everyone who comes here leaves with fresh inspiration and a renewed zest for a slower paced life. Throughout the day I tell stories or present anecdotes of experiences that I hope will encourage all to take a fresh look at the ordinary and realise that it is actually extraordinary. Chris : Advice for anything that one wants to do is simple. If you love what you do you will be good at it. Running courses that includes lunch, all materials etc. is a lot of work but the actual work element is small ( washing up etc.) because the day is a complete joy from start to finish. I especially love the time in the evening when everything has been cleared away and I go over the day. I remember the conversations, the laughter, the excitement of creating and I think to myself, it does not get better than this! Find out more about The Cozy Club here or follow Chris in her work on Instagram. Deb Brandon is the author of “But My Brain Had Other Ideas: A Memoir of Recovery from Brain Injury” and “Threads Around the World: From Arabian Weaving to Batik in Zimbabwe.” Here, she talks to us about her work and what inspires her. Jessica : I’d love for you to start by telling us more about you and your story, who you are and what it is you do? Deb : I was born in England and grew up in Israel. I came to the U.S. to pursue a Ph.D. in mathematics. I have been a professor in the Mathematical Sciences Department at Carnegie Mellon University since 1991. With weaving, my love for textile arts soared. I wanted to see (and feel) it all: scrumptious raw cashmere, hand-spun silk, gorgeous hand-wovens, an amazing range of ethnic textiles—silk scarves from Laos, felted slippers from Turkey. I am a member of WARP (Weave A Real Peace), a networking organisation whose mission is to foster a global network of enthusiasts who value the importance of textiles to grassroots economies. More than a decade ago, I suffered a severe brain injury. In its wake, feeling lost, I started to write about my recovery to help me through it. As I wrote, I realised that I wanted to reach a broader audience. I am now the proud author of two books: an award-winning memoir, “But My Brain Had Other Ideas,” and the recently released, “Threads Around the World: From Arabian Weaving to Batik in Zimbabwe,” about textile techniques from around the world. Jessica : Can you tell me about where you find your inspiration? Deb : Writing about textiles is a natural extension of my lifelong interest in handmade textiles and, especially, ethnic textiles, enriched by the changes that resulted from my brain injury. My brain injury damaged some of my filters. In particular, all outside data flows into my brain with equal value, causing traffic jams in my neural pathways. On the flip side, I now notice more details in the world around me, details that I was unaware of prior to the injury. For example, I can now enjoy the gradual changes in the colours of sunset and the many shades of blue in the water. My newfound ability to note such details influenced my work as a textile artist. Shortly after I returned home from hospital, I wove a piece of yardage I entitled “The Reflection of Sunset on the Water.” I painted warp in varying shades of blue and orange. I also painted the weft to produce the effect of waves rolling down the yardage. The yarn I used was a shimmering silk to give the effect of reflections of light on the ripples. I chose to weave in a variety of twills to give the fabric drape. I also supplemented the warp with sewing thread to add a wavy texture. I could not have produced such a piece prior to the injury. Other influences stem from traditional textiles. I’ve used patterns reminiscent of motifs from batik from Zimbabwe, I’ve woven in colours similar to those prevalent in Palestinian embroidery, and I’ve embellished textiles with a variation of Japanese fish printing. Jessica : I am also interested in knowing more about how you view creativity; is it something you can now rely on every day? How do you balance your varied interests? Deb : I have become much more creative since the brain injury. I attribute that partly to my increased awareness of and attention to detail, but I also believe that it has something to do with the rewiring of my brain as it healed. Pre-injury, I was primarily a linear thinker, and my thought process usually took me directly from point A to point B. My brain injury damaged my ability to think sequentially, in this linear fashion. As my brain learned to work around the damage, I found myself thinking more visually and using more intuition, so I now have access to a broader range of thinking styles. Between the different thinking styles I now employ, my brain injury-induced short attention span, and my need to live at a slower pace, I often find myself straying off the path, leading me in interesting directions, guiding me towards new ideas. Whenever I sit down to create, whether it is to write, knit, spin, or weave, I frequently find myself changing directions, changing the story line, manipulating colours, playing with patterns. My full time job as a mathematician takes up a lot of my time. In the past it was one of my top priorities. After a day of teaching, I’d come home to work on other aspects of mathematics. Now, prone to fatigue, I spend less time at the office and play catch-up at home. However, I spend much of my time at home on creating. Writing is very much a priority, and textile arts are next on the list. I try to write every day, in the morning before I go to work and in the afternoon after I come home. When it comes to the textile arts, I go in phases, spending more time on them when I have met math- and writing-related deadlines. Jessica : Where do you work? What’s important about your work space? Deb : When my son left home, I transformed his room into an office, which is where I write. The first piece of furniture I lugged there (with my son’s help) was a wooden desk I bought more than two decades ago. Much cherished, it has accompanied me through four moves. Until it found a home in my office, I had to share it with my now ex-husband and my kids. Finally, it is all mine, everything on it arranged the way I like. The entire space is arranged to be aesthetically pleasing and to serve my needs as a writer: my laptop perched on a pile of books so the screen is at eye level, a separate keyboard positioned such that I can type with elbows bent at a good angle, a bookcase filled with books that aid me in my writing (sources of information about ethnic textiles and about writing techniques), a printer to the right of my desk, and a bed for my dog to lie on beside me when I write. The floor loom I weave on most frequently sits in a living room corner, angled to give me the feeling of space around me. To the right of it I have a bookcase filled with books about practicing fiber arts, knitting, crochet, spinning yarn, felting, and surface design. To the left of the loom, I have a comfortable seat I can sink into when I knit or spin yarn. It faces the interior of room so I can be part of the activities around me, watching TV or chatting with family and friends—I can knit and spin by feel, so I can divide my attention. Deb : I give most of the textile pieces I create as gifts, to family and friends. To me, the most important part of fibre arts is the process. I also enjoy the design side of the projects, but I love the rhythm and meditative nature of the making. The end result often plays a more peripheral role—I take pride in my work, but once the project is completed, I’m already thinking about the next. In addition to getting a lot of satisfaction from giving textile pieces as gifts, I hope that by doing so, I am helping to educate the public about the value of handmade products, and to appreciate the effort, beauty, and stories so inherent to them. When I write about ethnic textiles, I hope to pass on that same appreciation. I believe that by doing so, I am sending an important message: Textiles help us create ties with each other. We are a part of a whole; there is no us and them, there is only us. Textiles prevent us from losing our humanity. On the other hand, my original intention when I started writing my memoir was personal. I hoped it would help me understand my new world as a brain injury survivor, and to cope with the enormity of it all. I also wanted my loved ones to understand the effect of this invisible disability. Shortly after I started writing about my recovery, I realised that other brain injury survivors might benefit from my experience. In time, as I began to reclaim my place in the world, I realised that I wanted to raise awareness among the general public about the struggles I and other brain injury survivors face every day. In order to reach such a broad audience, I knew I needed to improve my writing skills, so I hired a writing coach, who transformed me from a mediocre (at best) writer to an award winning author. In the process, I became passionate about my writing—writing daily became the norm. Not only was I now writing to convey a universal message, but also for the love of writing itself. Deb : I would tell them to make time to follow their dream. Life is too short not to. At the very least it’ll bring them joy and a sense of fulfilment, something we all need to help us through the rough stuff in life. They should try to ignore that inner voice that tells them to stay within their comfort zone. It’ll play on fears of change, coming up with excuses—“You don’t have time,” “The wash can’t wait,” “It’s not productive,” “I’m too tired,” “I’m not good enough.” Everyone needs to take time for themselves, and that goes double for creative endeavours. The end result shouldn't be the primary goal. Take the time to enjoy the process, even if that glass paperweight is wonky, you can’t afford a top-of-the-line bicycle, your embroidery stitches aren’t even, or your first (or fiftieth) draft doesn't work the way you want it to. Slow down and enjoy the scenery—the process of creating. If possible, find kindred spirits who share your dream—it’ll open up your world in wonderful ways. Find out more about Deb and her work here or follow her on Instagram, Twitter and Facebook. Sun streams through net curtains casting shapes and shadows on the floor. Noise builds in the eves, the shrubs and the crevices where small winged lodgers winter and build nests. 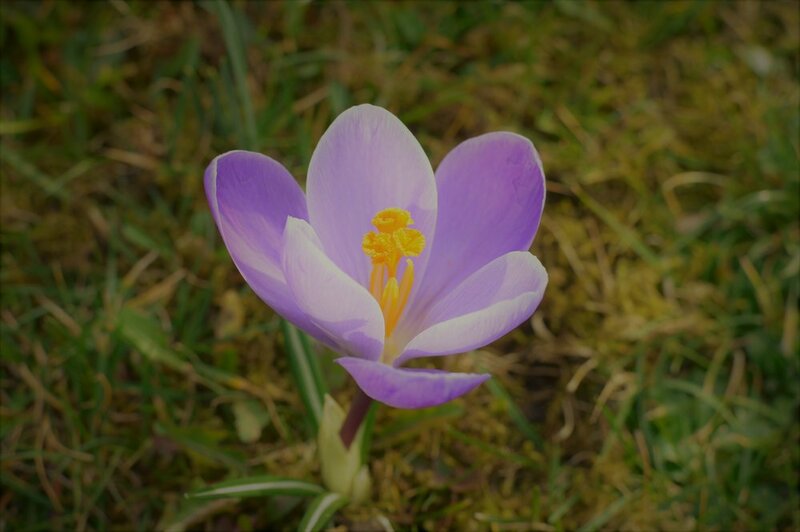 Hardy crocus bulbs burst through trampled ground to dust the village green in patches of purple and white. I feel light, the shadow of winter lifted. My mind fills with seed plans and long walks and toes dipped in rivers. I wonder where I stowed the tent, the flask and stove. Maps find their way into my fingers and are unfolded, carpeting the room with lines and contours and legends. My head fights the feeling. There was a frost just yesterday and the wood store is still stocked, enough fuel for another month at least. A sound brings me back to the room, four sandstone walls filled with light and lined with books. There’s a bumble bee at my window. She tips and taps and wants to come in. I lean across and stare through the single pane of glass. She’s as big as a cherry & hooped in yellow and black. Needle fine hairs and translucent wings beating faster than my heart ever should. She doesn't know that she shouldn't be here yet. It isn't her fault. I lean back in my chair and allow myself the sun and its warmth in this moment. One for which I’m equally grateful and sad. As life changes, we adapt and grow. I fish out a teaspoon from the kitchen drawer and make my first sugar syrup of the year. It’s on the windowsill now, a tonic for passing visitors in need of a helping hand. This year, I’ll make a plan. One that is kind and gentle. I’ll be mindful of my footprint and the impact it may have. I’ll tread softly, only take what I need and give back as much as I possibly can. This flash of spring in winter is a wake-up call. One I needed more than I knew. As adults it is our generation who have a huge – and unenviable - job on our hands. We need to be the ones who are making unprecedented changes to the way that we live and the way we consume. For a sustainable future we need to make it so that our children cannot remember a time when we had six plastic toiletry bottles around the side of the bath or discover that humans have destroyed the planet to the point that words like badger are taken out of the junior dictionary. The importance of convenience has trumped everything else for so long that we are finding it hard to change our ways. I’m one of the ‘we’. I have times when I really want to buy a roll of cling film because I think it’s faster and easier than the alternative of putting leftovers in a long-term reusable container or wax wrap. I’m not sure either is true - though our generation has been brought up to believe that it is. Never has there been more people creating and providing ways for us to make better choices. There are no-plastic websites, zero waste shops, plastic alternatives for almost everything we use, forest schools, outdoor education coming into schools and a trend to buy less stuff and be more mindful of what we are consuming as we move though life. I find it very inspiring. I believe that connecting children to nature lies at the heart of helping them make better choices. And I believe they will have a much deeper connection if it’s one that comes from lots of family time outside. If our children love being outside, walking though bluebells woods, spotting wildlife, digging in mud, pond dipping, climbing trees, making wreaths with willow and spending time outside I believe it will be so much easier for them to make choices based on what is best not what’s fastest. I understand fully that not all convenience is bad; I have some things in my life that I find very useful and believe they have more of a positive impact than negative. For example I get a meat box once a month so that I know where all the meat has come from – saving me the visit to a butcher - and I buy biodegradable wipes online. And part of my business also offers convenience. After 18 months of running forest school stay-and-play sessions for pre-school children I wanted to find other ways to get parents outside with their children. I know it can be really hard to find, prep and then deliver new activities when you have little spare time. So I have created a season activity box for children aged 2-6 years old and for their parents or guardians that provide a range of activities which allow the children to develop their skills, interests and understanding though practical, hands on experiences in the natural world. I hope that the activities encourage conversations, a sense of achievement, belonging and greater understanding of one another as well as giving the adult an insight into their child’s way of thinking. Training to be a forest school leader and spending an increasing amount of time outside (I have a dog and a family holiday home on Anglesey so I was already quite outdoorsy) has changed my life. I have a different perspective on things, I’m calmer, more mindful and notice the simple pleasure of life more easily now. If I can pass that on though forest school sessions or seasonal boxes then happy days. What’s your favourite thing to do outside with your family? Ellie Kelly runs Wonderwood Explorers in Farnham. Check out Ellie’s seasonal activity boxes here. Wheels ground to a halt this season when 45 cm of white, frosty flakes covered the roofs and lands in the course of one night. In a village with no plows, people took to brooms and shovels to make knee-deep paths in the snow. Promptly the horses and sleighs took over the arduous task of bringing freshly harvested alder and beech down from the woodlands during the week. On the weekends they engaged the tourists with a chance of a lifetime, to live like we all lived once upon a time: traveling upon a horse-powered sleigh to navigate the hilly lanes of the village, laughing all the way! In deep snow, wheels are no good, so we must return to our animal instincts and stumble-walk headlong into the drifts, casting our own bootprints in the snow. Though it is tempting to stay inside, toasty by the fireplace, nature beckons us to see the incredible beauty she has produced. Stepping out into a vast bed of snow is like venturing into the freezing sea, walking through it and forging your own path, however, is a measure of stronger willpower. If you know the lay of the land, then everything will be alright, if not, you might be in for a deeper surprise... It goes without saying, that if you know by heart the footpaths walked by generations and the way the land flows intimately, then navigating the covered terrain will be far easier, than to step blindly as a stranger on the first outing. In our part of the world, this means recognizing key trees and befriending the many haystacks that dot the landscape. As we walk familiar routes throughout the village spaces and beyond the edges of civilisation, we become acquainted with the age, season of harvest and shape of each haystack. Some weather gracefully, others slide and slump over time, while the rest remain forever young in body and spirit. Haystacks are the quintessential markers of the land and the pride of the landowners. As we indulge in our private collection of homemade preserves and sit in silence with determined reason, we already dream about blossoms aplenty - though we will not rush nature, patience is a winter virtue indeed. Follow Cheryl and her family as they navigate Instagram without a smart phone at Forest Creek Meadows. Was the first Creative Countryside Gathering only a year ago? It’s hard to believe more time has not passed, the connections made throughout this year have become so strong. At this, the first gathering of 2019, Eleanor arrived in Bratoft, Lincolnshire, early to set up alone, soon to be joined by the first arrivals for cocktails and nibbles. I was late to join after an unfortunate misunderstanding between ‘left’ and ‘right’, but we were all soon settled in the beautiful Old Rectory for a few days of good food, creativity and conversation. On Saturday a few rose early to catch the morning light, before we all joined for some grounding in the dew covered grass, and then to feast on pancakes with blood oranges and syrup. The day filled with activity, as we were slowly led by Eleanor to create journals, to free-write, and collectively to make a zine based on the moments shared that weekend. Somehow in this day full of creative pursuits, we also had time to wander nearby, chatting or taking photographs of the myriad of snowdrops that lay at our feet. As the night drew in we took to the comfy chairs with a warming drink to write, or sew, or think. We feasted that night by fairy light, on Indian food and gin cocktails, before we talking and laughing deep into the night. A much needed cooked breakfast brought our time to a close the next morning. Another gathering brought to a close with friends old and new, we said our fond farewells and took one last look at those grand walls, those happy rooms, and those snowdrop walks. See you next time? Jessica Townsend creates slow and sustainable fashion at House of Flint. Follow her behind-the-scenes on Instagram here. Jessica: I’d love for you to start by telling us more about you and your illustrations, how they started, and what it is you do? Raahat: I currently live and illustrate in a town near Oxford, England. It’s where I’ve been for most of my life and this creative journey is deeply rooted in my beginnings here. Art has always had a significant presence throughout my childhood. My dad worked in the creative industry - first in game development and then as a visual effects artist - so I grew up with his paintings on my bedroom walls, his sketchbooks on my bookshelf, and a treasure trove of his old painting materials. This certainly nourished my early desire to create. I’ve also had an affinity with the natural world for as long as I can remember. I spent a lot of time in nature with both my family and childhood friends. There was an abundance of tree climbing, den building, and frog catching. Rainy days were for dreaming up stories, painting landscapes, and drawing animals. My desire for a career in the arts really emerged when I went to university. I was 18, studying English and Creative Writing at Royal Holloway, University of London, and I wanted art to be more than just a hobby. Around that time, I started to share my work online and suddenly discovered that the internet was a wonderful place to connect with an audience, other creatives, and my future clients. I’m truly grateful to say that I’m now navigating this world of art and selling my work internationally. Something amazing also happened at the start of this year. In January, I signed with the wonderful Thao Le of the Sandra Dijkstra Literary Agency, and I couldn’t be more excited for this new chapter and the future adventures that await. Jessica: What do you love most about what you do? Raahat: The list is endless, though I’ll share the things that immediately come to mind. When I illustrate, I begin to recall places and stories from my childhood. I draw a lot of forests, meadows, woodland animals, and the sense of nostalgia that arises is quite special really. I often feel as though I am reacquainting myself with the magic, curiosity and childlike wonder that seems so hard to come by in adulthood. Although this career in illustration has been such a vibrant experience, self-doubt has almost always crept into the equation. Thankfully, however, through social media I’ve encountered an incredible community of individuals, who share the same passion for creativity and nature, from across the globe. These kindred folk have been some of my greatest supporters and motivators, each with creative journeys that constantly inspire me to grow, learn, and create. Jessica: Can you tell us about your work-space, and the methods you use to create your designs? Raahat: I illustrate from home and have my desk space set up by a window. Natural light is really important, not just so I can see but because it lifts my spirit. There’s a beautiful copse of trees beyond the window (the same trees that I used to climb with my siblings and friends from our childhood). My space is cluttered with things that bring me joy: books, candles, potted plants, treasures that I’ve collected on walks. There’s also the tools of the trade: my graphics tablet, sketchbooks, pencils, pens, and a little packing station for my Etsy shop orders. When I illustrate, I often listen to music or audiobooks, but when it’s warm enough, I open the window and let birdsong fill the room. As creatives, it is incredibly easy to get distracted - the to-do lists and looming deadlines can be particularly overwhelming - so I’ve tried to create a space where I am both comfortable and reminded to embrace the slow, mindful moments of peace. Having a view where I can watch the wildlife, the changing of the seasons, and peer at the moon after the sun has set is an extra bonus that I’m very thankful for. My method consists of a lot of experimentation. I think that’s one of the joys that comes with creative work. The realm of art is constantly shifting and mistakes are a welcome part of the process. Generally however, most of my projects begin as rough pencil sketches. After that, I determine a colour palette (usually inspired by earthy tones) before refining the final artwork. Jessica: I know your work reflects your love of nature, but what inspires the specific content of each piece? Raahat: Nature is everything. Much of what I create is dedicated to the wonder that the universe instils within me and I feel very lucky to live so close to the countryside. I keep a small sketchbook in my bag and take it with me when I’m off travelling or exploring the wilderness. You can never be sure when inspiration will strike! When you sit in an environment, observing the shapes, textures, colours, you suddenly attain this deep sense of awareness and alignment with the earth in that present moment. It’s these experiences that stay with me, moments in nature that I feel the desire to recreate when I’m back at my desk. Jessica: What impact would you like to create with your illustrations? Raahat: I went vegan five years ago after learning about the impact of animal agriculture on our planet and the exploitation of the peaceful beings we share this world with. Whilst my work doesn’t explicitly handle topics like veganism and environmentalism, I hope that the content inspires gratitude for the Earth and a desire to take care of it and our fellow earthlings. Beyond that, I want my illustrations to be a reminder to accept our inner child, because we are never too old to appreciate the light and magic that this world has to offer. Jessica: And lastly, if someone reading your story were inspired to follow their own creative dream, what advice would you give them? Rahaat: If you have a creative dream, then tear after it! Nurture your ideas and bring them to life. It helps to visualise and research, but don’t worry if you haven’t formulated a long term plan to begin with. Trust your instincts and go for it. Community has also been such an important part of my journey, for guidance, support and friendship, so don’t be afraid to reach out to fellow creatives. Embrace the fear and the mistakes, and enjoy the process. Follow Raahat on instagram, or check out her work here. If you love her work and would like to buy a piece head to her shop. Winter mornings can be a struggle to get up to when it’s cold and still dark outside. It makes me want to stay nestled underneath the duvet covers until the morning light appears through my curtains. But early on a cold and clear winter’s morning, magic begins to happen. Although it’ll still be dark outside, I’ll open up the curtains wide to see that the window panes will be frosted and condensated and cold to the touch. And if I peer through the window, I’ll just be able to see the ice formed on the windows of the cars parked along the street. I like to turn on the fairy lights for that warm, comforting golden glow to fill the room whilst it's still dark. I’ll wrap up warm in my dressing gown and sleepily head downstairs to boil the kettle for a big cup of tea. By the time I'm back upstairs, setting my cup of tea to one side on the bedside table, it will start to get lighter outside and that's when the magic begins. It will still be quiet outside, although with the hum of cars passing by the main road in the distance, sometimes catching the sound of a train chugging along its tracks at the nearest railway, a few birds chirping in the back garden and if I'm lucky, I'll catch a plump of geese flying close together over the house. There's no rush at this time of morning, just warmth, cosiness and the company of a good cup of tea and a book to read before I get ready for the day. As it begins to get lighter, just below the row of trees at the bottom of the street the sun will begin to rise and the colours of the sky begin to change. It sets alight with fiery oranges and peaches and notes of pinks, purples and yellows, that blend in streaks through the white clouds like watercolours bleeding across a canvas painting. The morning frost will glisten on the rooftops, across the lawns and down the paths of the street. Sprinkled around like fairy dust, dressing spiderwebs in tiny, delicate ice crystals, freezing old crunchy autumn leaves left trodden along the paths, clinging to the details on the veins of each leaf. The whole street will be transformed into a winter wonderland, as if everything has been lulled to sleep under a thin blanket of ice, until it melts away by the time the afternoon arrives. And so, when I get up just that little bit earlier with an extra slow hour to spare, it’s definitely worth it to see the magic on a winter’s morning. Yet, while the use of PFCs and microplastics is still considered essential by the industry, consumers are looking for other ways to reduce the environmental damage that is growing on the back of the outdoor lifestyle trend. One solution is repair and recycling. Meet Neza Petreca. Slovenian-born co-founder of Blind Chic and saviour of tired equipment. Over the last few years several leading brands have begun encouraging customers to return gear for repair, rather than discarding it. Patagonia have even gone as far as setting up pop-up repair shops for gear from any brand. However, Neza takes it a step further. When a piece of clothing is beyond repair she turns it into something new. In collaboration with her customers Neza looks first at repair and if this isn’t possible, they’ll discuss what material can be saved and what new item the customer wants from it. 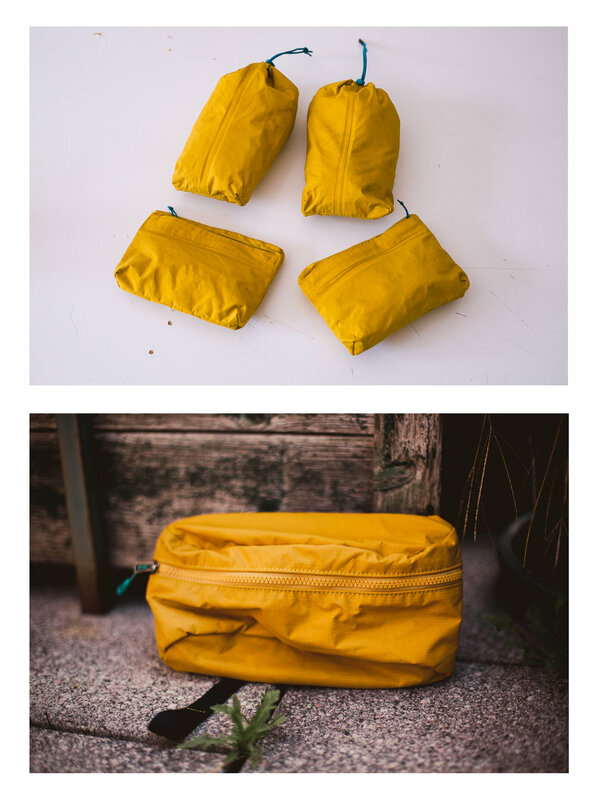 Her specialism is in bags so often Neza will make pouches, bikepacking bags or even rucksacks from damaged clothing and gear. It was the humble pouch that sparked her ambition to turn recycling into a business. Following the success of her DIY tutorial video on bikepacking.com, friends and family started approaching Neza with their old clothing. She’s been at it ever since. When Neza realised this was a passion she undertook an internship with Barbara Heinze, repair seamstress and owner of her own kids clothing brand. 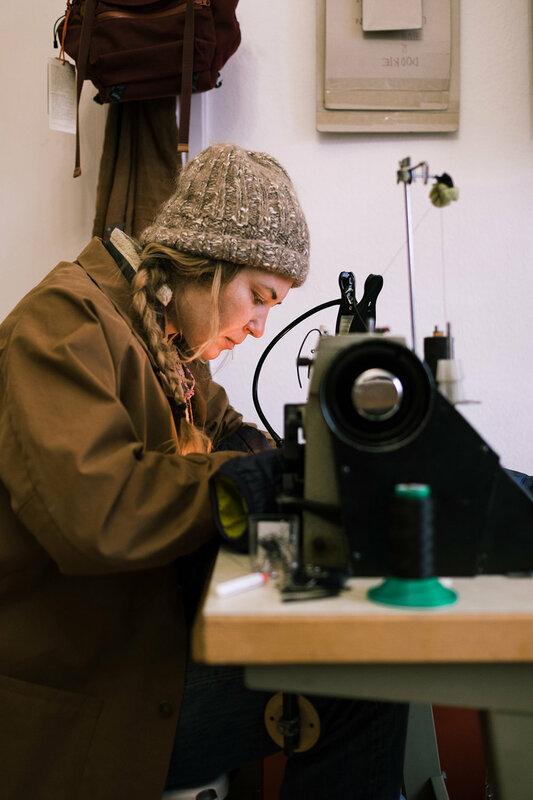 It was Heinze who taught her to see every repair as a new problem to solve and who instilled the confidence needed to start cutting up £500 technical jackets! Since returning to her native Slovenia, Neza has been putting her new techniques to work, as well as persuading anyone who’ll listen to consider where their old clothing goes. What happens to it once we’ve decided it’s worthless? The good news is Neza sees change happening. Once recycling was a thing people did because they couldn’t afford new. Now even the wealthy want to buy quality, take care of it and see it last. Customers have become curious; they want to know who’s making their products and where they’re coming from. In turn, this creates a mentality of investment. The customer knows the story behind their purchase which gives them a personal connection, not only to the brand but to the product. It’s an investment — both financial and emotional. 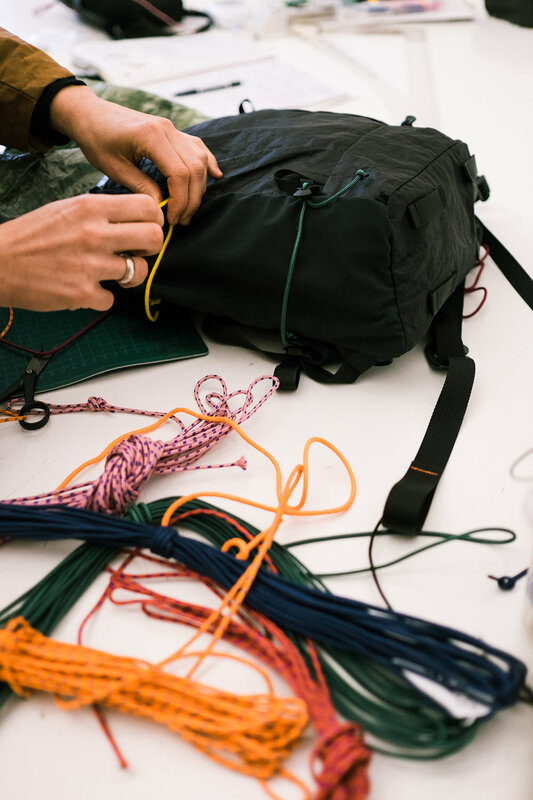 While the recycling work continues to gain momentum, the designer has set in motion plans to open her own repair shop in Bovec, the outdoor capital of Slovenia. In this tiny town, on the banks of the turquoise Soča river, she envisions a shop and community space offering outdoor education. After all, education is the force driving change in outdoor consumerism. In the meantime, if you’re interested in recycling or repairing your own equipment, contact Neza through her website.